Dr. Christina Vella, 75, passed away March 22, 2017. CHRISTINA VELLA is a native of New Orleans. She received her Ph.D. in Modern European and U.S. history from Tulane University. 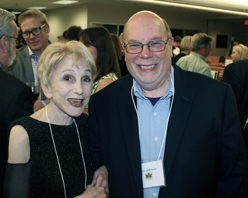 For many years she has taught at Tulane as a Visiting Professor, most recently in the Master of Liberal Arts program. She has been a consultant and writer for the U.S. State Department, NPR, PBS, and the History Channel. 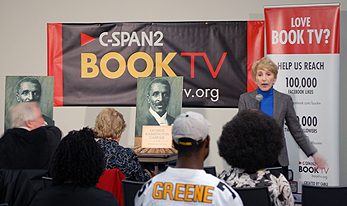 Celebrated both as historian and biographer, Dr. Vella is the author of Intimate Enemies: The Two Worlds of the Baroness de Pontalba; The Hitler Kiss written with Radomir Luza; Indecent Secrets: The Infamous Murri Murder Affair; George Washington Carver: A Life; and Ataturk and the Unveiling of Turkey, in publication. When her first book, Intimate Enemies, was featured on the cover of the New York Times Book Review, Dr. Vella began receiving invitations to lecture all over the country. She still enjoys lecturing to groups, conventions, and academic gatherings on a variety of topics in literature, Louisiana history, and world history. Intimate Enemies: The Two Worlds of the Baroness de Pontalba was a biography of a plucky little Creole who built the American Embassy residence in Paris and the lovely Pontalba Buildings in New Orleans after her father-in-law shot her four times and killed himself. The book serves as a kind of comparative study of daily life in New Orleans and Paris in the 19th century. Several more history books, centered in biography, followed. The Hitler Kiss, written with Radomir Luza, described the resistance movement that formed in Czechoslovakia after Hitler’s occupation of Central Europe. Next came a book about the Murri case, Indecent Secrets. The work recounted a trial in Italy in 1905 in which a prominent woman had gathered four of her admirers and inspired them to kill her husband. The true story was made into a soap opera that ran for ten years on Italian television. Dr. Vella’s next book was a biography of man who was considered a scientific giant in the 1940s, but whose name has faded now—George Washington Carver. And currently in publication is a long biography of that hero of secular governance, Kemal Ataturk of Turkey. All but one of Dr. Vella’s books were published by LSU Press, which she considers one of the very finest academic presses in the country. Dr. Vella is currently experimenting with fiction; she is writing a novel in which the main character is imaginary but two other major characters are actual historical figures —Enrico Caruso and Constantin Brancusi—rendered with biographical accuracy, aside from their bogus relationship with the heroine. In addition to full-length works, Dr. Vella has written a number of book chapters: “The Country for Men with Nerve” in Degas and New Orleans; “New Orleans at the Time of the Battle,” in The Battle of New Orleans Reconsidered; “The Czech Lands,” in European Resistance and the Second World War; “Dorothy Dix” and “The Baroness Pontalba,” in Louisiana Women: Their Lives and Times; “Paris in the 18th Century,” in Concorde: Hotel de Talleyrand and George C. Marshall Center; “El Corazon de España,” in Permanencia Cultural de España en Nueva Orleans. She has contributed several articles to the online encyclopedia, Louisiana History. Dr. Vella has received grants and honors over the years, including the Paul and Elizabeth Selley Fellowship; the Association of Secondary Teachers Recognition Award; “Best Books of 1997” in Publishers Weekly, New York Times, and Times-Picayune; Louisiana Endowment for the Arts grant; Louisiana Endowment for the Humanities (four teaching grants); Foundation for Historical Louisiana Preservation Award; The Humanities Book Award; Battle of New Orleans Historical Symposium dedication; Gamma Beta Phi Society recognition award; Nunez History Lecture Series Appreciation Award; and now the Louisiana Writer Award. Christina Vella has two daughters, Dr. Christie Riehl of Princeton, NJ, and Dr. Robin Vella Riehl of Houston, TX. 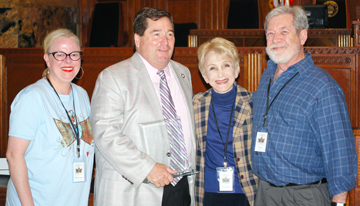 The Louisiana Writer Award is given annually to recognize the extraordinary contributions to the state's literary heritage exemplified by the artist's body of work.